Our prototyping process allows you to quickly and effectively test the proof of concept or produce limited volumes for design verification and clinical testing, without incurring the cost and time required for a full production tool. To facilitate this process, Meier has assembled a dedicated prototyping center to provide you with parts that closely simulate the progressively stamped metal components your final design will require. 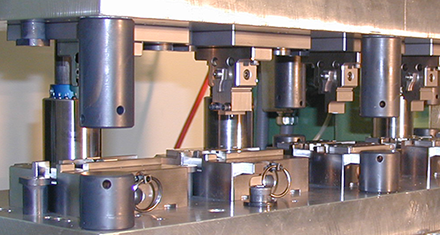 Through the use of our unique stage die system, we are able to simulate the progression of a full production tool in a fraction of the time. By using this method, the prototype components display the typical cut-by, shear, and other features and characteristics that are normally present only when stamping the parts during high-volume production. At Meier Tool, we understand the importance of mission-critical factors in designing and manufacturing both the prototype and part. We ensure our subassemblies provide operational reliability, and guarantee no incidents affect your critical to-function components. To make sure your requirements do not “compete” with production time, our prototype center is self-sufficient with its own dedicated engineers, toolmakers and short-run resources as well as the necessary Electrical Discharge Machining (EDM), milling and quality measurement capabilities required to do the job right the first time. Using computer numerical controlled plotters with EDM, we are able to create extreme fidelity on difficult-to-work-with materials. Our technologies cut the time and resources required for pre- and post-heat treatments that other manufacturing methods may require. EDM allows for exacting tolerance on even the most complex prototyping and unit designs. Since the tools never touch the material directly, our technology leaves no marks or burrs on the finished unit, guaranteeing compliance with high tolerance specifications. Although stamping yields the highest value when producing high volume components, it is also useful for the production of midsize and small volumes. To support shorter runs, Meier offers options to meet your volume requirements and our production volumes range from a few dozen to millions of components. 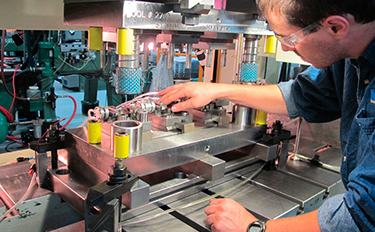 Producing a quality progressive or automated transfer die is only half the story. After production release, Meier will continue to support your ongoing production requirements. With our focus on the customer, we strive to provide you with a worry-free supply chain that includes the use of inventory management tools such as KanBan replenishment and consignment inventories. KanBan allows us to encourage further efficiencies by promising JIT (just in time) unit delivery, sidestepping many of the bottlenecks present in traditional manufacturing. Together with our consignment inventory supply chain, Meier provides materials as soon as needed, with continuous workflow. This decrease in downtime means less time spent waiting to clear production steps and their associated cost. In addition, we continually focus on improving our Operational Excellence to help control costs and reduce waste, which further enhances your competitiveness. Meier Tool concentrates on value stream mapping that takes into consideration how to best meet your requirements within our procedures. We are constantly benchmarking your project’s progress to keep all KPIs on budget and on time. Meier’s veteran engineering team performs real-time monitoring to determine if any performance efficiencies can be implemented, prioritizing the production schedule as it happens. Our innovative strategies and extensive experiences in high-precision stamping allows us to be flexible with your prototype and part requirements as they happen. This also gives our customers with smaller or custom requirements the necessary amount of time to pivot on mission-critical manufacturing decisions. As an added service, we provide complimentary ongoing tool maintenance and repair support throughout the viable life of the tooling. Our dedicated maintenance and repair shop assures that the production dies are ready to use when needed and we maintain spare components to replace parts that become worn or damaged through normal wear and tear. Meier has developed both in-house secondary operations capabilities as well as a network of approved suppliers that offer a complete range of finishing operations to best meet your custom component requirements. In addition, our relationship with other Cretex Medical companies gives our customers access to machined components (rms); molding processes (JunoPacific); custom surgical instrumentation and sterilization case and tray products (rms Surgical); and laser cutting (Spectralytics), providing a truly comprehensive solution for most component and sub-assembly requirements. With decades of stamping experience, Meier has the capability to work with a wide range of metals. We possess a deep understanding of material properties and forming characteristics and can assist you in finding the best material solutions for your components. Raw material coils can be selectively plated before stamping with precious metals such as gold, silver and palladium to minimize the cost of the precious metal and eliminate secondary processing. Bi-metals used in the manufacture of thermocouples and thin layers of precious metal can be bonded to the raw material to provide surface integrity, which is superior to plating. Dual-gauge or multi-gauge coils enable the manufacture of profiled component parts with varying wall thicknesses. Continuous coils of hardened tempered material can be selectively annealed prior to stamping to provide localized ductility. 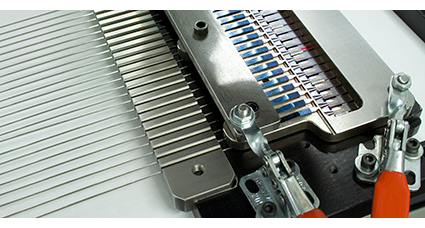 Meier designed a process to laminate polymers to metals prior to stamping.